Begin by talking to Lucien, located just north of the Ardougne Castle. Firstly, speak to Lucien who can be found in a small house just north of the Ardougne Castle. 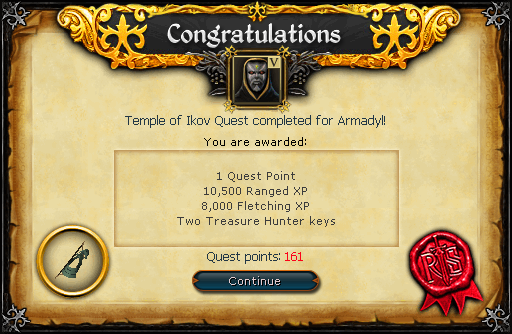 Tell him that you're a great hero, and he should say that he needs the Staff of Armadyl. Now tell him that it sounds like it would be a laugh, and he will say that the monster that guards the staff can only be defeated with a weapon of ice. He'll also give you a Pendant of Lucien. The Temple of Ikov can be found just east of the Fishing Guild, and just southeast of the Ranging Guild, but before going you should bring both a Lit Candle, and a Knife or other sharp weapon such as a Sword. You can buy a Candle from the shop in Catherby, and then just use a Tinderbox with the Candle to light it. You can also bring some light armor, but be sure that your total weight is 3kg or less. Now, equip your Pendant of Lucien and head to the temple. Climb down the ladder and follow the tunnel west, and then climb down the stairs at the end. In the northeast corner of the room is a small space, blocked by a spider web. Just use a Knife or other sharp weapon to cut through, and then take the Boots of Lightness. Put the boots on, and then climb up the stairs. Head through the north gate and walk over the bridge to the northwest. If your total weight is more than 0kg, you will fall into the lava and take about 200 points of damage. You'll then need to climb up the nearby ladder and try again. After you cross the bridge, open the door and go inside of the room. Take the lever in the southwest corner and then cross over the bridge again. Head back out of the gate, to the ladder where you first entered the temple. On the south wall is a Lever Bracket; use the lever that you picked up before with the bracket, and then pull it. If you do not pull the lever before leaving, you will have to get the lever again. This will unlock the second gate, but you may want to bring some melee or Ranging armor, food and a Yew or Magic bow before continuing, in order to prevent another trip later. After you have everything you need, head back to the temple and follow the tunnel west. Now go through the south gate, and follow the passage until it changes into an icy tunnel. You'll find several chests in the small inlets on either side of the passage. Search each one to find some Ice Arrows. It is theoretically possible to beat the fire warrior with just one arrow, though it would be wise to bring five to ten. 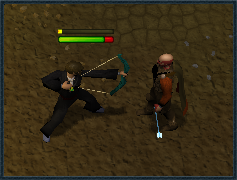 Use combat abilities as much as possible to limit the number or arrows used. Searching all the chests and then changing worlds to reset the respawn before searching them again is a good way to accumulate arrows. The chests are surrounded by level 60 ice spiders and you will be there a while, so food and armor is recommended if you are level 120 or lower. Head back through the path, through the gate and then back through the gate to the north. Now head northeast until you find a lever on the wall. Be sure to Inspect it for traps first, and then pull it down. Now head west and open the door at the end. You'll find another door inside of this room, but when you try and open it you'll be faced with defeating the Fire Warrior of Leskarus (whose level depends on yours). He will use magic on you, so the Protect From Magic Prayer will help a great deal. You'll need to Range him with the Ice Arrows that you picked up, and you will only have several minutes to kill him. After defeating the warrior, you'll be able to pass through the door. Now talk to Winelda, who will teleport you across the river of lava for 20 Limpwurt Roots. After that, follow the path all the way to the end and pick up the Shiny Key. Head back along the path and push the wall leading into the large room that you passed before. You'll be in a room with many level 43 Guardians, and now you need to make a choice as to which side you'll join. Remove your pendant and speak to a Guardian. Tell him that you're looking for the Staff of Armadyl, and that you'll get a grand reward for it. Tell him that it's time for your yearly bath and that you'll help. He will give you an Armadyl Pendant, which you can wear. Now leave the room and climb up the ladder to the east. Use the key with the door and you'll be just north of McGrubbor's Wood. Teleport to the Edgeville lodestone. Walk towards the Grand Exchange, but turn south after crossing the river. Lucien's house should be just south of the fairy ring. Attack him while wearing the Armadyl Pendant. After defeating him, you'll be finished with the quest. 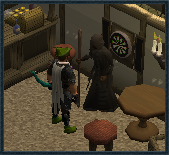 Try and take the Staff of Armadyl from the room to the northwest, and you'll be attacked by any Guardians in the room. After defeating them, take the staff and leave the room. Climb up the ladder to the east and unlock the door using the key. Find Lucien (explained above) to claim your reward.